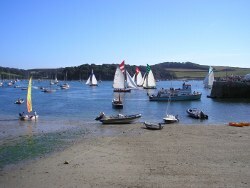 September 2006 saw the first St Mawes Fish festival which proved to be so successful, that a second was planned and took place in 2007 again during September. The festival was put together by local individuals and businesses and involved the fisherman, chefs from the nearby pubs, fish merchants, and the sailing club who organized the Working boats race that followed. It was a great opportunity to show the visitors what exactly our fisherman catch, and thanks to the chefs, how it tastes! The fisherman were on hand to educate, with a selection of fish from the previous days catch, many that you wouldn’t normally see in a supermarket fish counter. They were certainly kept busy with a huge influx of questions about the fish, their boats, why’s and how’s. The cooking team comprised of locals and chefs from the Victory Inn and Rising Sun, each offering their own individual expertise over the BBQ. Offerings included, amongst other things, scallops that couldn’t of been fresher having just been passed over from the ‘St Mawes Pro- Chucking team’! The scallops were available straight off the BBQ or in their raw state, £5 per dozen. Rob Wing was also their demonstrating how to fillet and prep various fish, and with years in the fishing industry you had to keep a close eye, as this was some speedy filleting. We were extremely lucky with the weather, blue skies and light winds, not ideal fro the working boats race, but it was just enough. Next year there will be another Fish Festival based on the success of this one, only next time the Pier & Harbour Company will have a great deal of involvement for the organizing.